Natural fiber plastic composites were made from Nigerian grown bamboo (Bambusa vulgaris) and high density polyethylene (HDPE) by extrusion and evaluated for strength, sorption and thermal properties. Composites were manufactured using two different screened bamboo particle size fractions (<2 mm and < 0.5 mm). The composites were tested for flexural properties, water sorption, melt flow and thermal properties. The melt viscosities at 190oC were 22.3 ± 0.91 kPa·s (<2 mm) and 27.4 ± 1.2 kPa·s (<0.5 mm). The results obtained indicated that the composites made with the smaller particle size fraction had higher flexural strength (37.4 ± 1.0 MPa) and modulus of elasticity (2.0 ± 0.2 GPa) than those made with the larger particle size fraction (29.9 ± 1.1 MPa and 1.7 ± 0.1 GPa). Dynamic mechanical analysis (DMA) also showed higher dynamic storage modulus for the <0.5 mm particle-based composites than those made from the <2 mm particle size fraction due to higher density and better interfacial interaction between the fiber and matrix. Also, the composites made with the smaller particles and were more dimensionally stable (water absorption of 5.4% versus 18.5% at 61 d). The bamboo composites had thermal stablility range of 265 – 279oC (onset degradation temperature). The composites made with the smaller bamboo particles possessed the better properties in comparison with those made from the <2 mm. Particle size and density significantly affected the mechanical, physical, thermal and rheological properties of the composites evaluated. Adefisan, O.O. ; McDonald, A.G. 2017. Evaluation of Wood Plastic Composites Produced from Mahogany and Teak. International Journal of Advanced Engineering Research and Science 4(12):27-32. ASTM international (ASTM D 790-07). 2008. Standard test method for flexural properties of unreinforced and reinforced plastics and electrical insulating materials. In Annual book of ASTM standards. 08(01): 151- 161. West Conshohocken, PA.
ASTM International (ASTM D 1106-96). 2006. Standard test method for acid-insoluble lignin in wood. In Annual book of ASTM standards. 04(01): 183-184. West Conshohocken, PA.
ASTM International (ASTM D 1108-96). 2006. Standard test method for dichloromethane solubles in wood. In Annual book of ASTM standards. 04(01): 187-188. West Conshohocken, PA.
ASTM international (ASTM D 1238-04c). 2008. Standard test method for melt flow rates of thermoplastics by extrusion plastometer. In Annual book of ASTM standards 08(01): 277-290. West Conshohocken, PA.
Bowyer, J.L. ; Shumsky, R.; Haygreen, J.G. 2007. In: Forest Products and Wood Science: An introduction. 5th Edition. Blackwell Publishing, Ames, Iowa, pp 204-205. Balduino, A.L; Balduino, T.Y; Friederichs, G; da Cunha, A.B; Brand, A.A. 2016. Energetic potential of bamboo culms for industrial and domestic use in Southern Brazil. Ciência Rural 46(11): 1963-1968. Clemons, C.M. ; Stark, N.M. 2009. Feasibility of using saltcedar as a filler in injection-molded polyethylene composites. Wood and Fiber Science 41(1): 2–12. Fabiyi, J.S. ; McDonald, A.G. 2010. Effect of wood species on property and weathering performance of wood plastic composites. Composites Part A 41(10): 1434–1440. Fabiyi, J.S. ; McDonald, A.G.; Morrell, J.J.; Freitag, C. 2011. Effects of wood species on durability and chemical changes of fungal decayed wood plastic composites. Composites Part A 42(5): 501–510. Gallagher, L.W. ; McDonald, A.G. 2013. The effect of micron sized wood fibers in wood plastic composites. 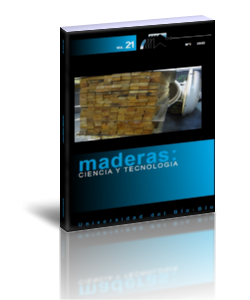 Maderas-Cienc Tecnol 15(3): 357-374. Gardner, D.J. ; Han, Y.; Wang, L. 2015. Wood-plastic composite technology. Curr Forestry Rep 1: 139-150. Gnanaharan, R.; Janssen, J.J.; Arce, O. 1994. Bending strength of Guadua bamboo. Comparison of difficult testing procedures. Kerala forest research institute, Peechi. International network for Bamboo and Rattan and International development research centre, Canada. pp24. Han, G.; Lei, Y.; Wu, Q.; Kojima, Y.; Suzuki, S. 2008. Bamboo–Fiber Filled High Density Polyethylene Composites: Effect of Coupling Treatment and Nanoclay. Journal of Polymer and the Environment 16:123–130. Harper, D.; Wolcott, M. 2004. Interaction between coupling agent and lubricants in wood–polypropylene composites. Composites: Part A 35: 385-394. Kim, H-S.; Kim, S.; Kim, H-J. ; Yang, H-S. 2006. Thermal properties of bio-flour-filled polyolefin composites with different compatibilizing agent type and content. Thermochimica Acta 451(1-2): 181-189. Kubat, J.; Rigdahl, M.; Welander, M. 1990. Characterization of interfacial interactions in high density polyethylene filled with glass spheres using dynamic-mechanical analysis. Journal of Applied Polymer Science 39(7):1527-1539. Lim, Y.T. ; Park, O.O. 2001. Phase morphology and rheological behaviour of polymer / layered silicate nanocomposites. Rheologia Acta 40: 220 – 229. Luo, S.; Cao, J.; McDonald, A.G. 2016. Dicumyl peroxide induced interfacial improvements in biocomposites of poly(3-hydroxybutyrate-co-3-hydroxyvalerate) and lignin via in-situ reactive extrusion. ACS-Sustainable Chemistry and Engineering 4(6): 3465-3476. Ou, R.; Xie, Y.; Wolcott, M. P.; Yuan, F.; Wang, Q. 2014. Effect of wood cell wall composition on the rheological properties of wood particle/high density polyethylene composites. Compos Sci Technol 93: 68−75. Rangaraj, S.V. ; Smith, L.V. 2000. Effects of moisture on the durability of a wood thermoplastic composite. Journal of Thermoplastic Composites Material 13(2):140-161. Ren, W.; Zhang, D.; Wang, G.; Cheng, H. 2014. Mechanial and thermal properties of bamboo pulp reinforced polyethylene composites. BioResources 9(3): 4117- 4127. Sadiku, N.A; Bada, S.O. 2017. Technical rotation age for naturally-grown bambus vulgaris for fibre, fuel and structural applications. Journal of Tropical Forest Science 29(4): 541-548. Seebauer, V.; Petek, J.; Staudinger, G. 1997. Effects of particle size, heating rate and pressure on measurements of pyrolysis kinetics by thermogravimetric analysis. Fuel 76(13) 1277-1282. Stark, N.M.; Berger, M.J. 1997. Effect of species and particle size on the properties of wood-flour filled polypropylene composites. In Proc. Functional filler for thermoplastic and thermosets, Interteck conferences, San Diego, CA. December 8-10. Pp. 1-16. Sulaiman, M.S; Ramle, S.F.M; Geng, B.J; Hashim, R; Sulaiman, O; Ibrahim, N.I; Zaudin, N.A.C. 2016. Babusa vulgaris: chemical composition and cell wall structure. European International Journal of Science and Technology 5(9) 27-39. Wei, L.; McDonald, A.G.; Freitag, C.; Morrell, J.J. 2013. Effects of wood fiber esterification on properties, weatherability and biodurability of wood plastic composites. Polymer Degradation and Stability 98: 1348-1361. Wei, L.; Stark, N.; McDonald, A.G. 2015. Interfacial improvements in biocomposites based on poly(3-hydroxybutyrate) and poly(3-hydroxybutyrate-co-3-hydroxyvalerate) bioplastics reinforced and grafted with α-cellulose fibers. Green Chemistry 17: 4800-4814. Wunderlich, B. 1973. Macromolecular physics: crystal structure, morphology, defects. Vol. 1. Academic Press, New York, NY. pp. 388-389.